IPM, used for decades in agriculture and structural pest control, calls for a systems approach to reduce the number of pests, and the amount of pesticides applied to crops and structures. 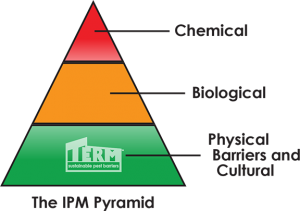 IPM is often explained by using the “IPM Pyramid”. IPM’s objective is to minimize the use of chemical pesticides (the red area) as well as the lower impact biological pesticides (the yellow area). Pesticide minimization is best done (the green area) by having a culture of cleanliness and inspection, and by designing pest barriers into the structure. When you design nonchemical pest barriers into a structure, you are using the IPM systems approach.